Left to right, Barack, his Grandmother Sarah, Auma Obama (Barack's stepsister) and Kezia Obama (Barack's stepmother) in 1987. 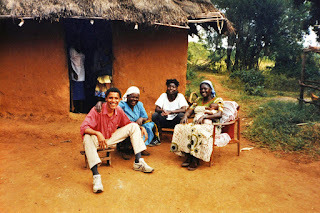 Barack Obama on his first visit to Kenya in 1987. 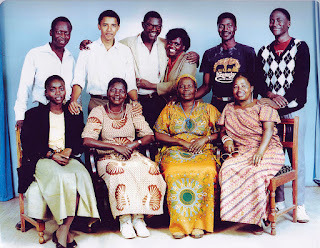 In this Obama family photo are: (bottom row, from left) half-sister Auma, her mother Kezia Obama, Obama's step-grandmother Sarah Hussein Onyango Obama and unknown; (top row, from left) unknown, Barack Obama, half-brother Abongo (Roy) Obama, an unknown woman, brother Abo, and another unknown.